AJ is a predictable color breeder - no exceptions. AJ has over 85 crias on the ground, 67% are black, 32% are brown, and 1% is gray– from dams from white to black. 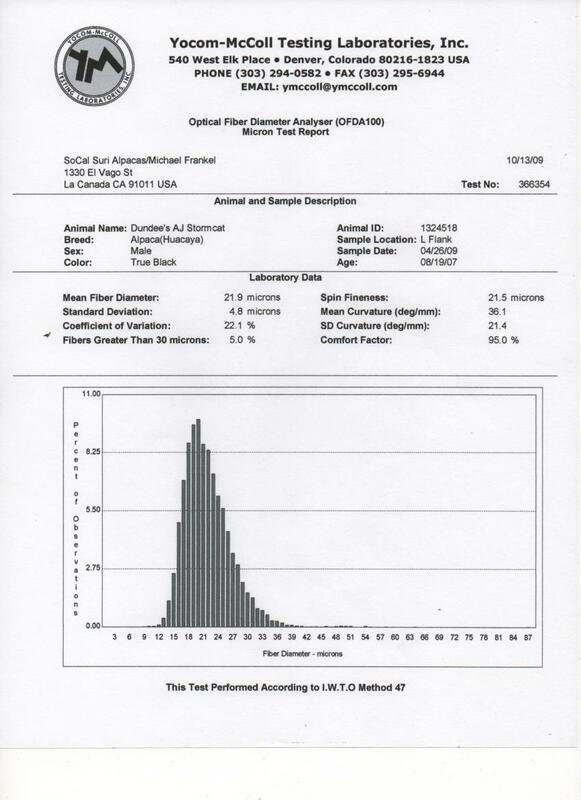 When bred to black, 100% are black. Color is no problem for this boy. Our two-time Color Champion Tina is as good as it gets. Her liniage from both her sire and dam bring the bloodlines of Camelio, Geronimo, and Guellermo into full play. Solid conformation, the head of a champion, and soft, consistent, crimpy fiber always puts Tina at the head of the class. $18,000 Sire of many champions! Stormcat is VERY black (3 of his 4 grandparents are black!) --it's late summer, and his fleece is Blue-Black--it actually looks like black velvet! 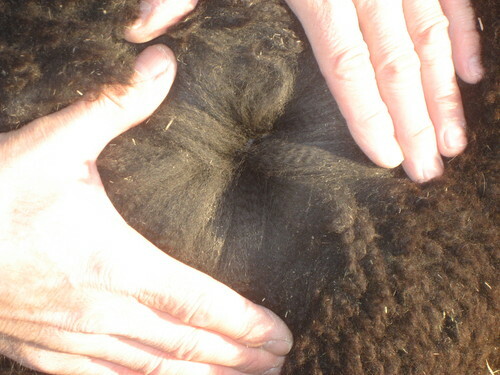 He has a long long staple, a very bright fleece with pleasing medium crimp and organized structure. Very big bone on a correct, compact frame, with a level topline and fleece all the way THRU his toes. He has a teddy bear head that is so appealing on huacayas, with a good bite, and a pleasing personality that is worth breeding for, aside from everything else! 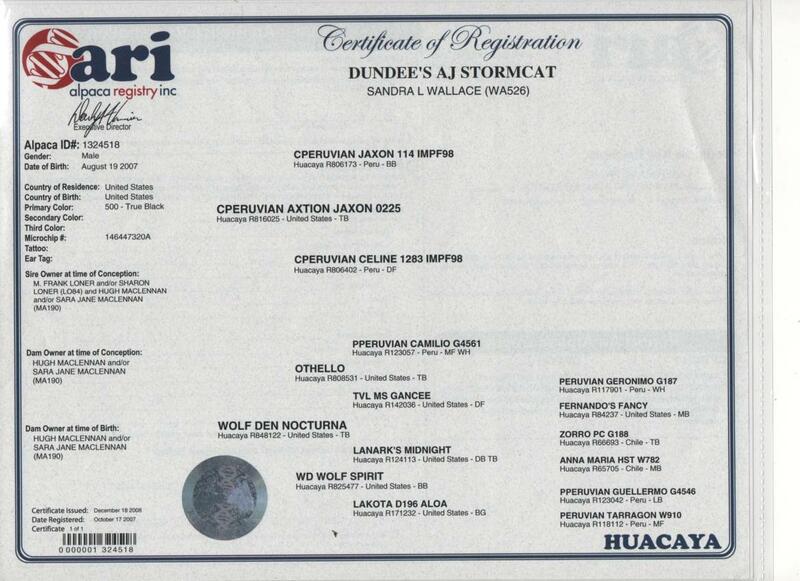 Stormcat’s pedigree is a "who's who" of names – Accoyo Camilio, Pperuvian Guellermo, CPeruvian Jaxon as an impressive sampling. His sire is a 4x Champ with retained fineness in his fleece – at 8 years old he was still holding a 22 micron fleece – this is a heritable trait! 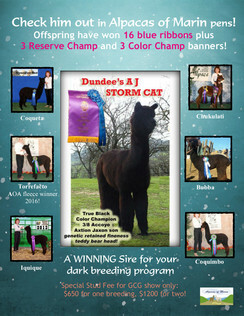 Sire Axtion Jaxon is known for throwing dark color and grey, and Stormcat has EVEN MORE black in his heritage. 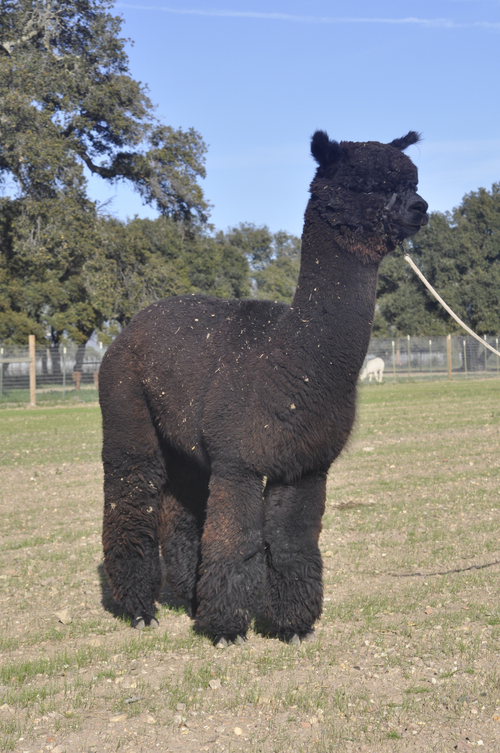 Stormcat's crias are on the ground--a BRIGHT fawn out of fawn, and a fabulous bay black (with a silver nose!) out of a light fawn dam. 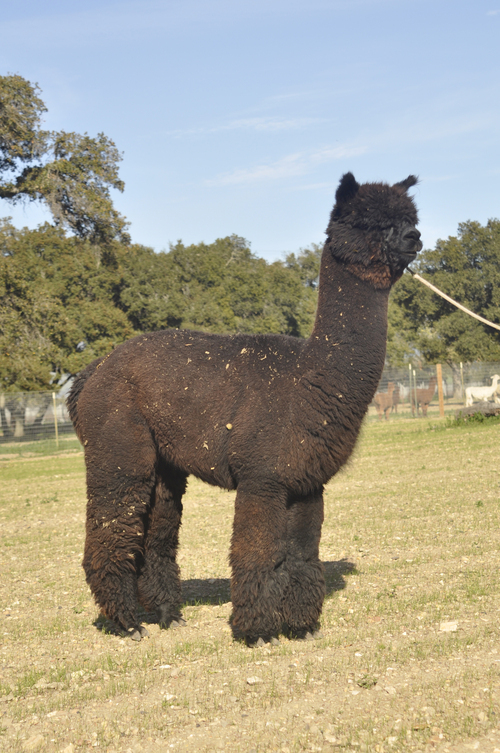 His third cria, a dark brown girl, is clearly improved from her dam--she has bright, finely crimped, consistent and organized fleece, and an adorable conformation--she won 2 championships plus numerous blue ribbons and sold at a year of age. There's also a lovely black girl who has taken 2 Championships, and a black male who took a blue ribbon his first time out-- and more to come. In addition to passing on his dark genetics, Stormcat seems to pass on his perfect, compact conformation and head, fineness (for black), good growth in the crucial first 6 months, and outrageously long and luxuriant eyelashes! 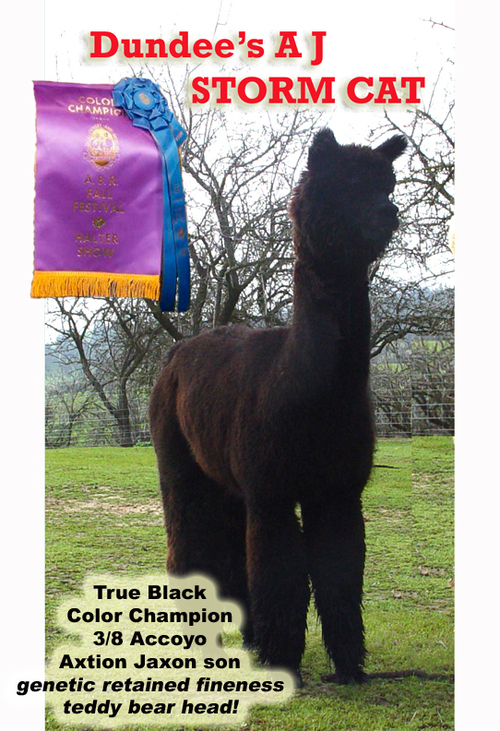 BREAKING NEWS: EACH of Stormcat's five crias for Alpacas of Marin has taken home a blue ribbon in halter competition their first time in the ring, and 2 of the 5 (Chukulati and her full sister Iquique) have taken color championships their first time out! WHOO-HOO!! Stormcat placed 3rd of 11 in very, very tough competition for the Dark/Mixed Get of Sire Class at the 2013 SWRAS! We are absolutely thrilled to have him place behind Amber Autumns' Eclipse Alyst and Marquam Hill's Snowmass Trilogy--Stormcat placed above outstanding herdsires that are practically "household names"! 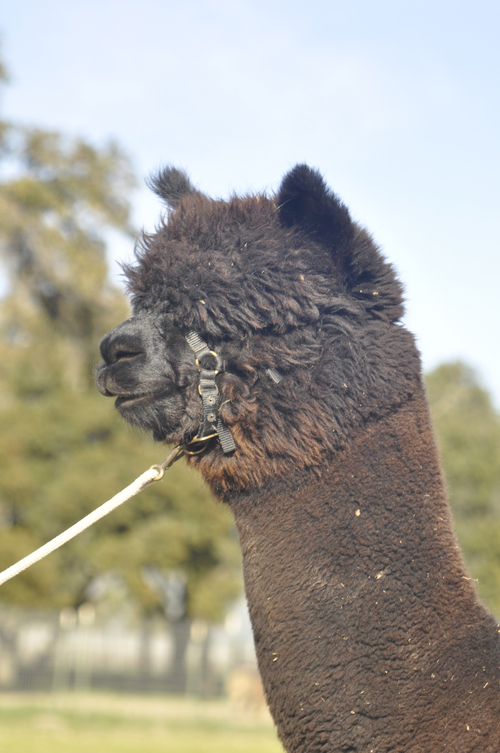 Stormcat has made the rounds of West Coast Alpacas ranches over the years, but he has finally come to his "real" home at Alpacas of Marin in the North San Francisco Bay area--west of Petaluma and Novato. We have Stormcat and his champion True Black son, Torrefacto. We figure we will sell one of them and be thrilled to keep the other. We have a lot of Stormcat offspring now, so it's time to sell off either him or his son. Blue Black Girl with Blue Ribbon! He's next in our line of multi-champs..! Multi-Champ Girl, Black Champ Sire! Multi Champ TB gal by TB Champion Male! LF boy by Black Champion?! Silver girl with 20.2 AFD!